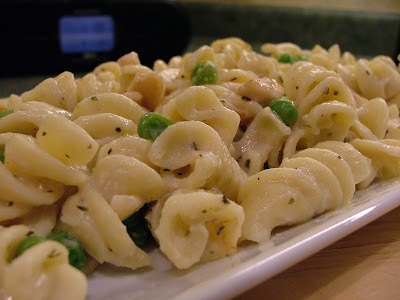 This past weekend I ignored my music collection, put the iPod away and relied on my kitchen radio to provide the musical inspiration while preparing this Creamy Chicken and Peas Rotini. The radio dial landed on a local jazz station and I left it there as I find the sounds of jazz have a way of warming a room. It was perfect for a cold winter’s night. It was also appropriate because jazz is often unpredictable, with its frequent changes in rhythm, and this dish was equally full of surprises because I was combining whatever was available in my kitchen at the time. I started with leftover grilled chicken. I love creamy chicken pasta dishes so I whisked together a cream sauce similar to one I had used on a past penne pasta recipe. Along with cooked rotini, onions and thawed frozen peas, it was quite good for a spur of the moment meal! It reminded me of a restaurant style pasta dish without being overly heavy on the salt. As for the jazz music, it kept the mood chilled with its relaxing sounds. One tune I recall was a Grammy winning song called “Solitude” by Dianne Reeves. Thankfully Dianne’s gorgeous voice warmed the atmosphere as I cooked this welcome dish in solitude in an empty house on a chilly winter's night. How often do you listen to jazz while cooking? Love to hear how many of you tune into jazz while cooking! In a large saucepan cook pasta according to package directions. Drain and set aside. In a medium saucepan, whisk together milk, flour and mustard powder until smooth. Heat over medium-high heat, whisking constantly, until mixture bubbles and thickens. Remove from heat. Stir in cheese, vinegar, salt and pepper. Cover and set aside. In a large saucepan, heat oil over medium heat. Add onions. Cook and stir until onions begin to soften, about 3 to 4 minutes. Add garlic, oregano and basil. Cook and stir for 1 minute. Stir in peas and cooked chicken. Remove from heat. Add sauce and cooked pasta. Stir until combined. Season with salt and pepper. Serve. I like just about every type of music except for Hip Hop and Jazz. So I would have to answer #3. I think your pasta dish looks dreamy. Hey "I Sing", thanks for sharing your thoughts on the pasta and the music. I felt the same way about Jazz for the longest time but now I'm starting to come around...just like my mother said I would. Scary!